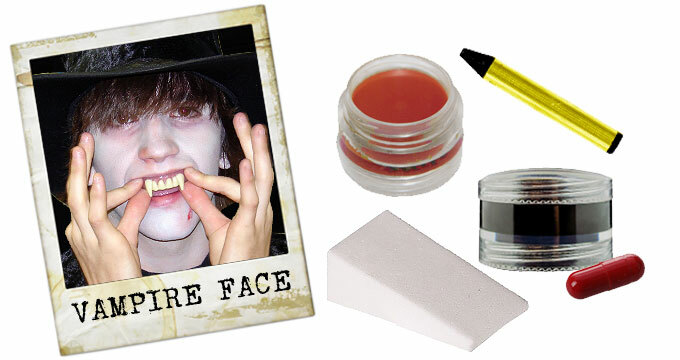 Halloween Face Painting is easier than you think, and most kids hate masks! They get hot and sweaty under the latex and usually end up taking them off before the evenings end. Most schools won't allow masks anyway, so face painting is the answer for creating a scary look to wear all day for Halloween. A Skull is a popular request for Halloween face painting. 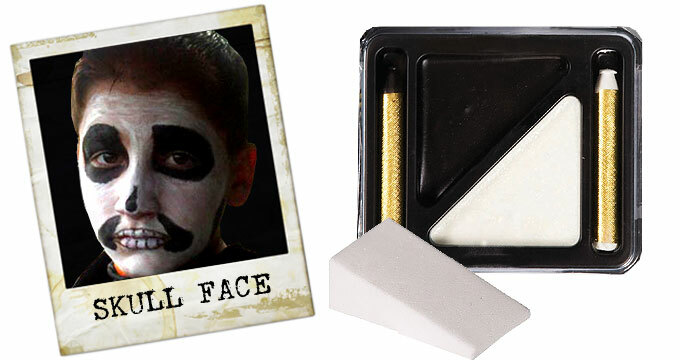 Create this easy skull face with our Black and White Makeup Kit, a makeup sponge, and Baby powder. Start with a clean face, then apply a base with White cream makeup, applied with a makeup sponge. Add Black cream makeup with a different makeup sponge to the back of the jaws to narrow the face. With the Black makeup stick create large circles around the eyes. Next create "hollow" areas around the mouth and the tip of the nose by outlining them with the makeup stick and then filling them in. Next, create the illusion of teeth on the lips by outlining the lips and drawing vertical lines. Finally, fill in the larger areas with the Black cream makeup, including the eyelids. Dust the face with Baby powder to seal the makeup and give it a matte finish. Face painting doesn't always have to be a character, as in this example of a spider web design. Create this fun spider face using our Black and White Makeup Kit, a makeup sponge and some craft items from your local craft store. 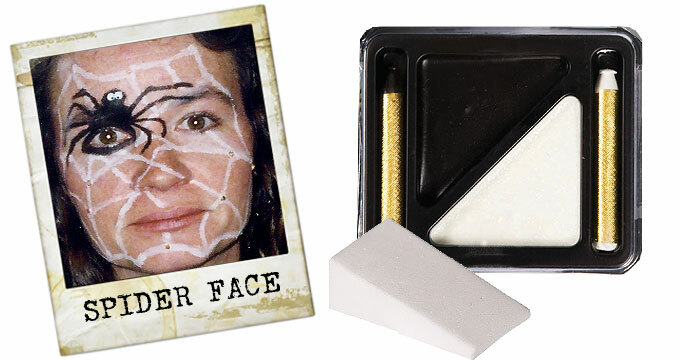 Start with a clean face and then use the white makeup stick to outline your spider web. Start with the outside shape and then connect lines randomly. Draw curved lines rather than straight. Next make your spider. Draw a thick outline with the Black makeup stick around your eye, and then two circles on top of it, each one a bit smaller than the first. Fill in the circles with Black cream makeup. Finally, create eyes for the spider with a dab of White cream makeup and make small dots in the center with the Black makeup stick. For our application, we used Glow In the Dark Paste On Eyes and some tiny Clear colored rhinestones to create the illusion of water beads on our web. We applied these using eyelash glue and they stayed on quite well. Creating an undead look such as the pale "bluish" look of a vampire is a blending technique that can be used for a number of immortal characters. Create this scary vampire face with our Creature Stack Cream Makeup, a makeup sponge, and a Black Eyeliner. Start with a clean face and apply a base of Undead Purple from our Creature Stack Cream Makeup. Be sure to cover the eyelids, ears, and neck. Blend the makeup into the skin using a makeup sponge. Next create sunken eyes with Bruised Red from our Creature Stack Cream Makeup by dabbing a small amount under the eyes and along the top of the nose bridge. Blend into skin with finger or small piece of a makeup sponge. Outline the eyes with a black eyeliner to make them stand out. Finally to complete the blood-thirsty look add a few drops of fake blood to the corner of the mouth allowing it to run a little. Finish off with a set of costume teeth or try our Dracula Fangs for a realistic Vampire look. This is by far the easiest of the examples we will show you. 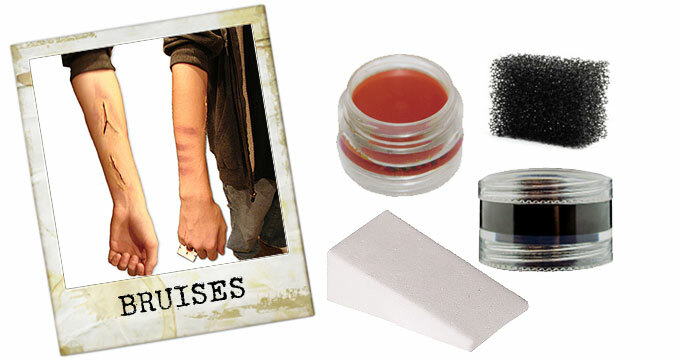 Create realistic bruise injuries with our Creature Stack Cream Makeup. a makeup sponge and Baby powder. Fresh looking injuries should always have some bruising around them, but bruises look great by themselves like the ones shown on the forearm in the picture. We did these by smearing Bruised Red from our Creature Stack Cream Makeup on our hands and then pressing our fingers onto the the arm leaving fingerprints. For the raised injuries on the underarm we added some latex prosthetic scars. We then used Bruised Red and Corpse Yellow from our Creature Stack Cream Makeup by dabbing the makeup around the scars with a makeup sponge. The Corpse Yellow was used closer to the prosthetic scar, applied with a small piece of a black stipple sponge and then applied the Bruised Red with a makeup sponge around the edges of the scars and up the arm. Finally we used a cotton swab to fill in the scar prosthetic with some fake blood and ended up with some realistic looking "man-handled" injuries. To create this scar faced prisoner look we used a piece from our Don Post Medium Cuts Prosthetic, Spirit Gum, and our Creature Stack Cream Makeup. First clean the area you want to place the prosthetic with alcohol and a cotton ball. The skin should be makeup free for the best effect. Next, trim the edge of the prosthetic to fit the space but don't trim too much, leave enough for the glue application. Dab the area with a Spirit Gum adhesive and then apply a thin layer of adhesive to the back of the prosthetic scar piece. Using your finger, tap the adhesive until it becomes tacky and then place it onto the face. Blend the scar into the skin using a flesh colored makeup around the edges. Add a small dab of the Corpse Yellow and Undead Purple, from our Creature Stack Cream Makeup, and blend with a small piece of black stipple sponge, working from inside to outside the wound. Finally add a little blood gel to the scar center using a cotton swab. 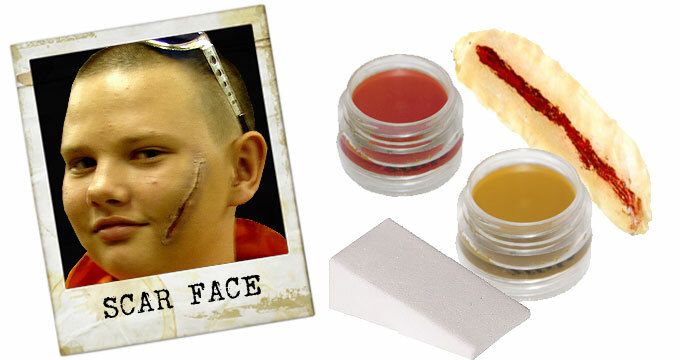 Use Spirit Gum Remover to remove the makeup prosthetic when you are done wearing it. Have fun with your Halloween face painting and don't get discouraged, as it is easier than it looks and all of our Halloween makeup washes off easily with soap and water.